"After spending a blissful imaginary day hiking the banks of a sylvan stream, I took a few hours out to fish a clear mountain pool, and pulled a pair of dappled brown trout from its icy depths, but that's another story. Walking upstream, I make my way at last to the idyllic hideaway I portray in Evening in the Forest. Somehow, I knew it would be there, although I've never visited this place before. 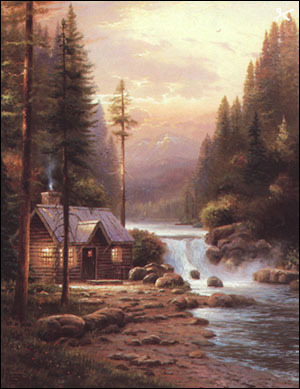 When I spotted the cabin, bathed in the welcoming amber light of evening, I smiled in recognition. It's good that I've found my way here as evening has already begun to deepen the shadows of the woods. A radiant sunset touches the water with luminous purple lights; the reflections of the trees in the stream are painted with a magenta-tinged palette. The wildness of wood and stream has not been tamed, but it has been softened by just a hint of the comfort of home. Evening in the Forest is rich with the promise of sweet repose." 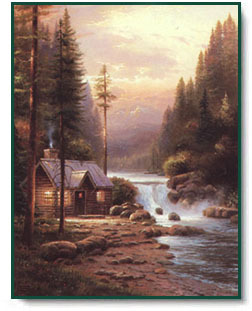 Evening in the Forest copyright © 1995 by Thomas Kinkade.